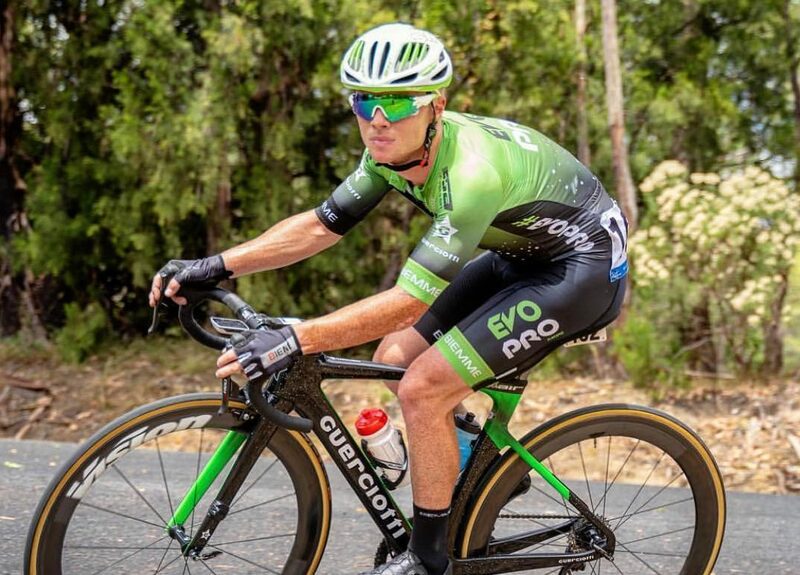 Having already won the Gravel and Tar Classic for EvoPro Racing, Luke Mudgway was scuppered by Team Sky earlier today in Australia for another victory. Mudgway is a former track world champion and would have been fancied in a sprint for victory from today’s breakaway at the Herald Sun Tour. 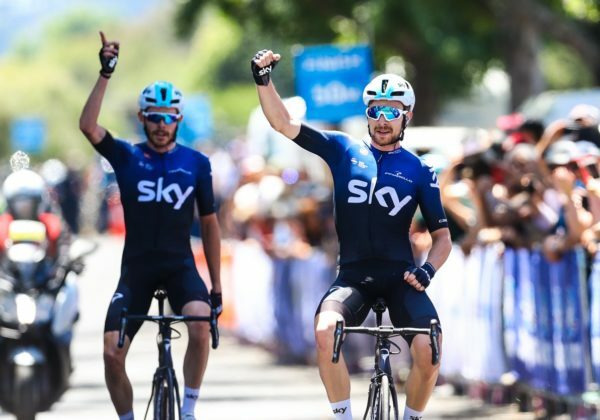 However, among the nine riders in the escape on the 127km stage from Sale to Warragul in Victoria were Team Sky’s Owain Doull and Luke Rowe. And on an incline about 5km from the finish, the Team Sky riders took flight and rode away. Behind them Mudgway really dug deep to try and get them back. However, Liam White of (Drapac Cannondale) managed to push clear of the chasers and claim 3rd. And as the remains of the breakaway split, Mudgway led home a trio of riders for 4th place on the stage. 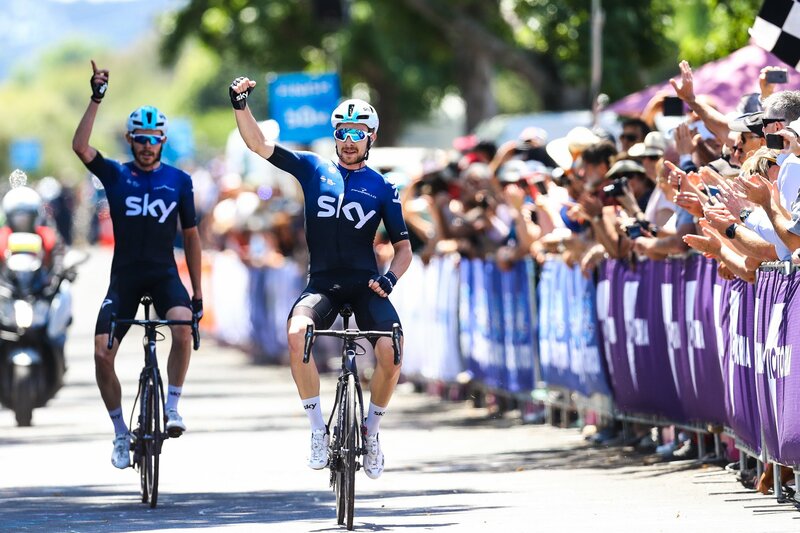 Luke Mudgway of Irish team EvoPro Racing leads Team Sky’s Doull in the nine-man escape on the third stage of Herald Sun Tour earlier today in Australia. A late-comer to cycling and now aged 32 years, Canadian Michael Woods has developed into one of the best riders in the world. He has yellow in Australia and he has already come close to dropping Porte on the climbs. Mudgway spent most of the stage up the road in a breakaway featuring nine riders. He had already won Gravel and Tar (1.2) in New Zealand in a sprint from a breakaway. And though he took the sprint for 4th today, he was left to rue what might have been had it come down to a gallop for the win. Still, it was another very good performance by EvoPro racing; Mudgway finishing just 36 seconds on winner Doull. EvoPro Racing also took 3rd on the opening stage of the Herald Sun Tour with Wouter Wippert. And it had two riders in the escape – Cyrus Monk and Shane Archbold – on yesterday’s second stage. 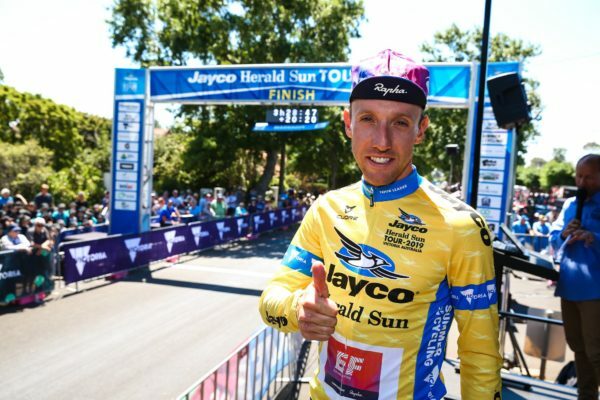 Michael Woods (EF Education First) is leading the Herald Sun Tour having won stage 2. He and Richie Porte (Trek-Segafredo) escaped on the gravel road climbs. Today Woods retained that lead as he finished in the peloton some 1:19 down on the Team Sky winner and runner-up. Woods has just four seconds in hand on Porte in the GC, with the hilly Arthurs Seat stage to come tomorrow. And Team Sky’s Kenny Elissonde is next; in 3rd overall at 27 seconds. The only Irish rider in the race is Ryan Mullen; the Trek-Segafredo man finishing in 54th on today’s stage some 1:37 down on the winner. He is 38th overall at 8:23. 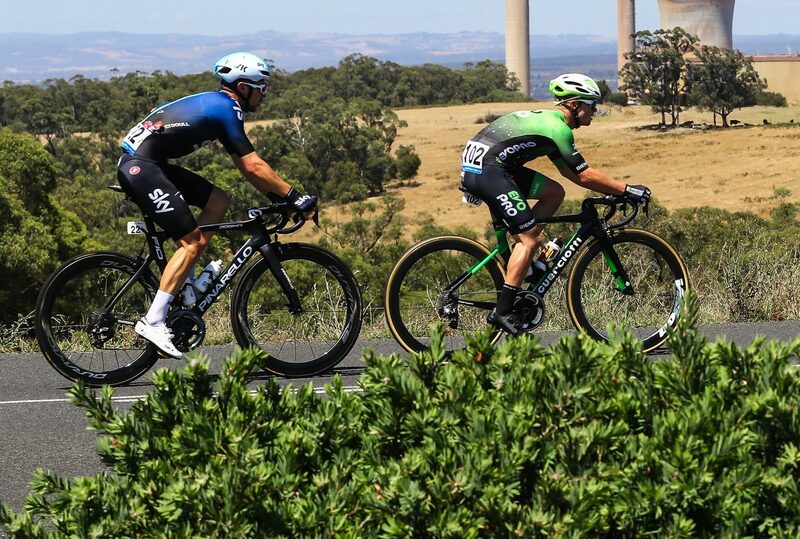 Today, nine riders including Doull and Rowe, Luke Mudgway (Evo Pro Racing), Neil van der Ploeg (Bridgelane) Connor Murtagh (Olivers Real Foods), Ryan Cavanagh (St George), William Clarke (Trek-Segafredo), Nathan Elliott (KordaMentha) and Liam White (Drapac) gained a five minute lead. A crash on the outskirts of Sale brought down several riders and resulted in newly crowned Australian Road Race Champion Michael Freiberg (Sunshine Coast ACA) being forced out of the race with grazing and bruising to his face.